Over the past few days, you ought to have been introduced to Bill, the stick-man who has been given the enormous task of telling the whole world how to behave. You might have seen all sorts of ridiculous memes with Bill as the subject matter, which admonish us to be like Bill. I have pooled a few below, in case you haven’t seen any- meaning you might have been under a rock for the past few days. 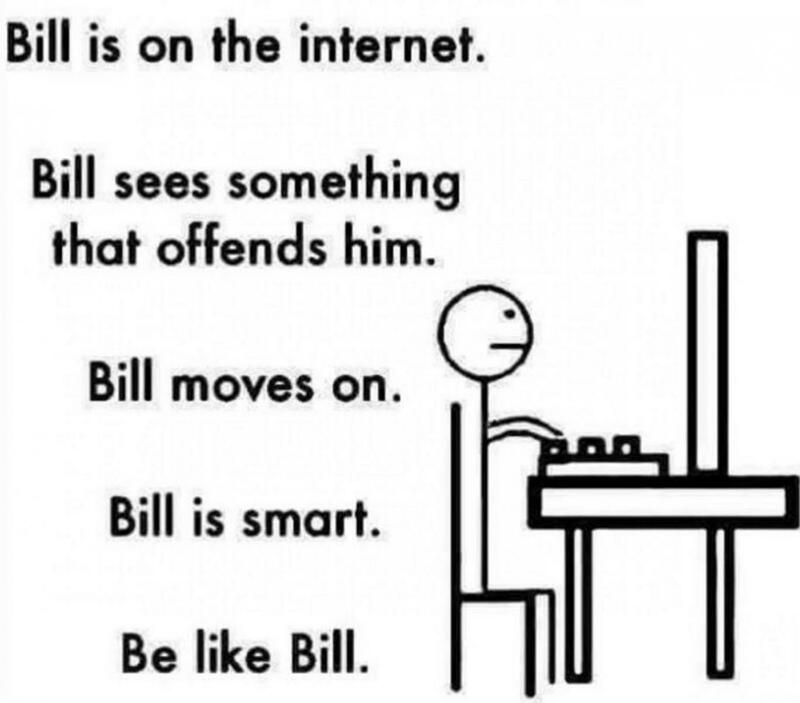 When I first met Bill, it appeared as if the point of the meme was to somewhat tell everyone how best to behave online. So Bill will advise you not to be a movie spoiler, not to invite your Facebook friends to play candy crush, or advise you not to troll anonymous people on the internet because you disagree with them. As the days went by and I observed Bill more, I noticed that Bill’s terms of reference had extended beyond advising us about internet culture and behavior, to advising us generally about what should be acceptable behavior. Bill now has an opinion about everything, from how you walk your dog to how you conduct yourself at the gym. No wonder some people think Bill is rather smug. 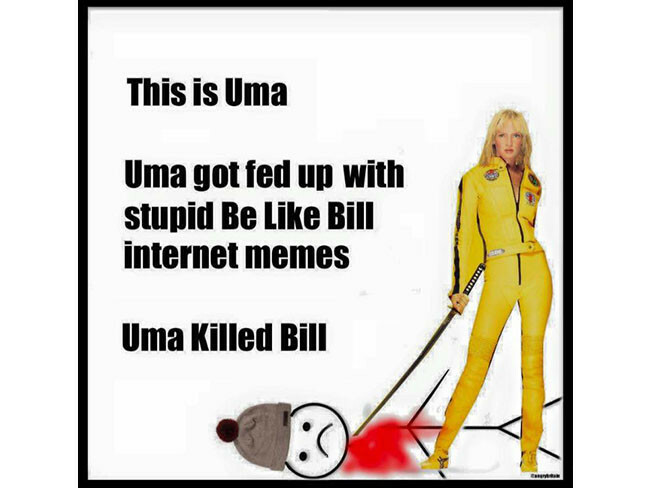 Bill has received mixed reactions, and some people have reacted so violently to Bill, that they have asked Uma Thurman to kindly kill Bill. I admit that there is a certain level of conformity that is required, but rather than label it conformity, I would rather say that there is a certain level of consideration that is required from us by society. So I think Bill is right to advise you not to play loud music on the train in consideration of the comfort of others, but outside scenarios where we have to be considerate of others, we have no obligation to listen to Bill, especially when he seems to be stifling our individuality. When this happens, our adherence to Bill’s advice should end because part of the beauty of humanity is that fact that we are all so different. Different things excite us, and we should not be caged to celebrate only one type of different. If you are a foodie and you are excited to share your food experiences on your timeline, then it shouldn’t matter that there is another foodie on your timeline who will have the same experience as you , but choose not to share it. The fact that you travel around the world and you don’t post pictures, doesn’t make you more polished or better than those who do, it only means you are different from them. So I appreciate Bill to the extent that he informs us about how best to take others into consideration when we act, but beyond that, I will gladly tell Bill to shove his opinion in an undesirable place. 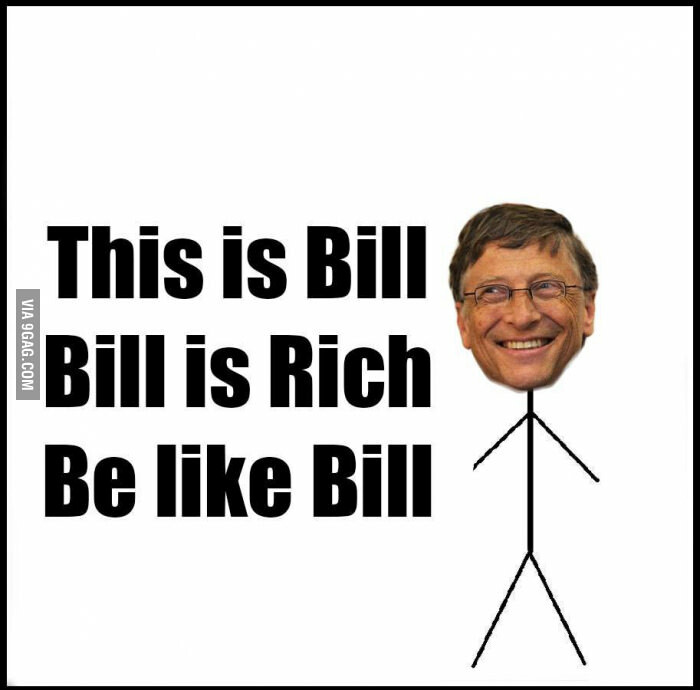 Bill is just a symbol of society, made up of you, me, our friends and family. We are always silently watching, silently judging, silently castigating others for expressing their inner selves, because we don’t agree with them, understand them or sometimes because we are not as bold as they are. Let us be considerate of each other, but please let us celebrate our differences, quirks and strange little things that make us stand out from the next person. You can wear your hair long, short, in dreads or twists and Bill should not have an opinion on that. 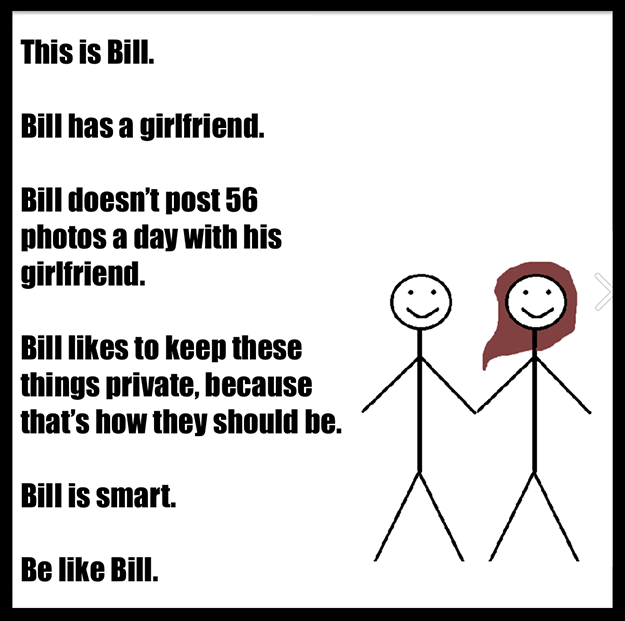 Be considerate, but don’t be like Bill, or like Mariam, be like YOU! 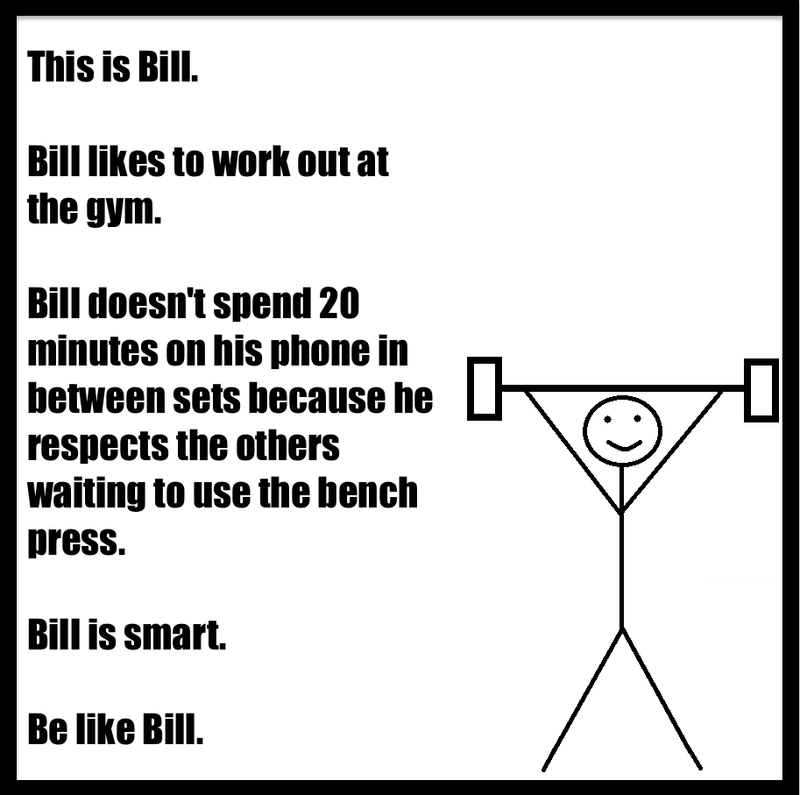 This is my best meme so far on the be like Bill trend. I burst out laughing when I saw this.